"I love found natural objects and primitive structures, like suddenly finding a cairn while wandering in the woods. I used to walk in the woods when I was little, and I remember when nature was magical to me—the growth of unfamiliar plants, the discovery of animal tracks, little cairns and forts left there by the neighborhood children, and the feeling of smallness and awe as a child in the woods." Art jeweler Emily Wiser is inspired by ancient jewelry and natural artifacts. She is interested in form, shape, and texture, and connects her art to nature and primitive antiquity. She is fascinated by ancient jewelry, primitive stone animal carvings, minimalism, and wabi-sabi design. Wiser uses traditional goldsmith's fabrication techniques along with new techniques she's developed on her own. She likes to create pieces from ingots, and enjoys finding "controlled randomness" in her forms. She frequently uses reticulation, which involves heating silver until the top surface melts and then freezes in wave-like shapes. 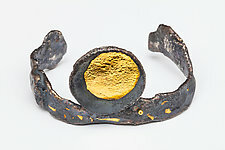 Emily Wiser earned Jewelry Technician and Graduate Jeweler Certificates from Revere Academy in San Francisco in 2011 and 2012. She also earned a Diamond Certificate from the GIA in Carlsbad, California, in 2014. She has studied with many leading jewelry artists, including Alan Revere, Sandra Enterline, Michael Boyd, Kent Raible, and Andy Cooperman.